There are three ultrasonic water level sensor ranges available including 3 ft, 12 ft, and 48 ft to meet a wide variety of applications. 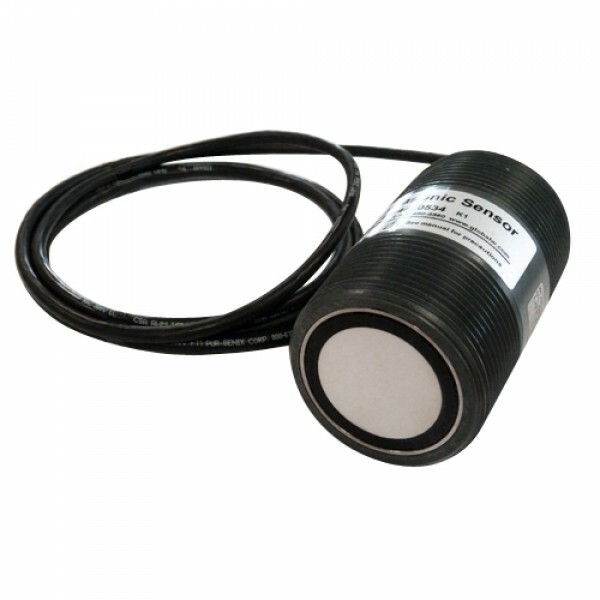 The unique 3 ft range ultrasonic water level sensor is ideal for measuring flow in small flumes and weirs. The 12 ft and 48 ft ultrasonic water level sensor ranges are best for measuring river, lake and tank levels and for measuring open channel flow in larger flumes. Ultrasonic water level sensor installation is simple and requires no programming or calibration. No maintenance is required for the ultrasonic water level sensors. The WL705 Ultrasonic Level Sensors are rugged, reliable and completely weatherproof - ideal for sewer or wastewater applications. The sensors are easy to mount, come with a 6 ft standard cable and complete instructions. The ultrasonic water level sensors are easy to interface to all PLC's, SCADA and telemetry systems with its simple 3-wire 4-20 mA output. The WL705 Ultrasonic Water Level Sensor is compatible and provided optionally with the Global Water FC220 Open Channel Flow Monitor and the PC320 Process Controller (for water level control). Water Level Range: 3 ft. Includes 6 ft cable. Water Level Range: 12 ft. Includes 6 ft cable. Water Level Range: 48 ft. Includes 6 ft cable. Standard ultrasonic water level sensors include 6 ft of cable, but can be purchased with up to 500 ft of cable.